Did you know that Pamukkale is the leading tourist destination in Turkey? 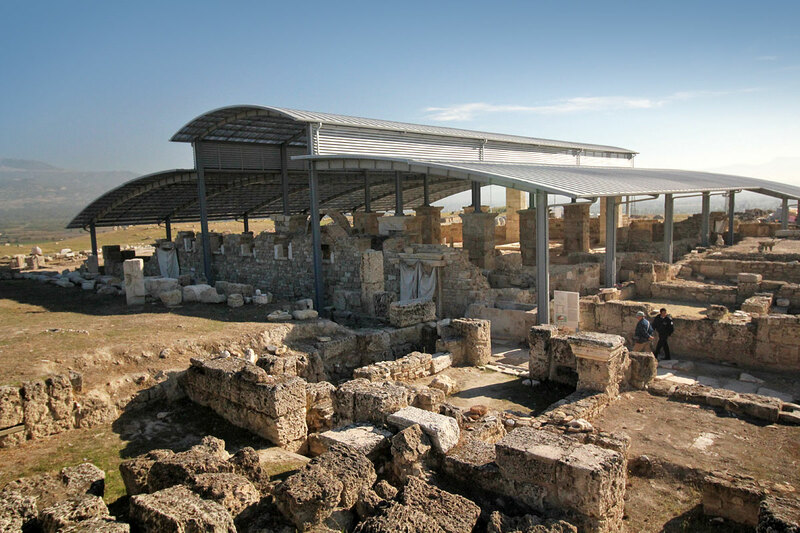 Receiving over two million visitors annually, the calcium travertines together with the ancient city of Hierapolis rank first in terms of both visitors received and tourist revenue earned. A remarkable statistic considering that Pamukkale is treated largely as a day-only destination. As astounding as the travertines are, Pamukkale’s lack of tourist destinations coupled with its proximity to Selçuk-Izmir encourages mostly short-term commitments to the area. Unless they’re making it an overnight transit stop between cities, many travelers choose instead to take an early 3-hour train from Selçuk or Izmir to Denizli. 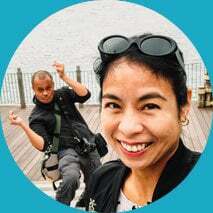 They’ll spend the day exploring Pamukkale and Hierapolis before taking a train back in the early evening. In the words of a few TripAdvisor commenters, there just isn’t enough here to merit a stay. 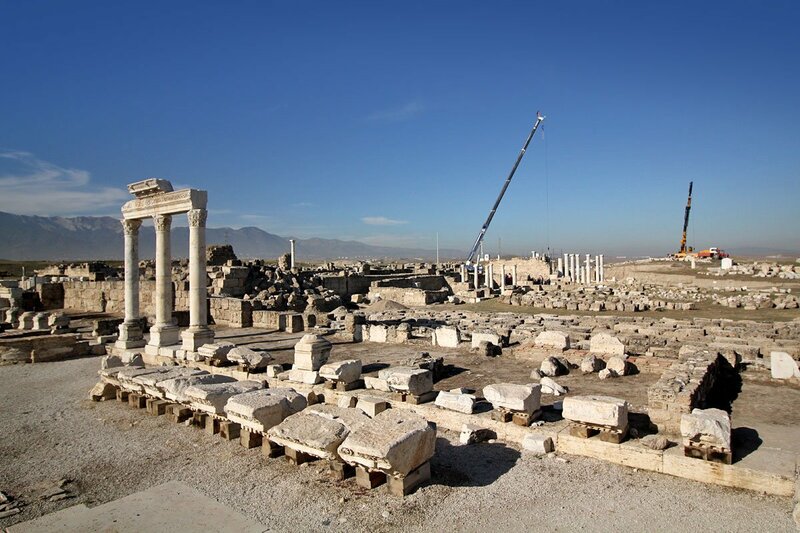 The restoration of Laodicea — an ancient city of commercial and religious significance just a few kilometers south of Pamukkale — hopes to change all that. 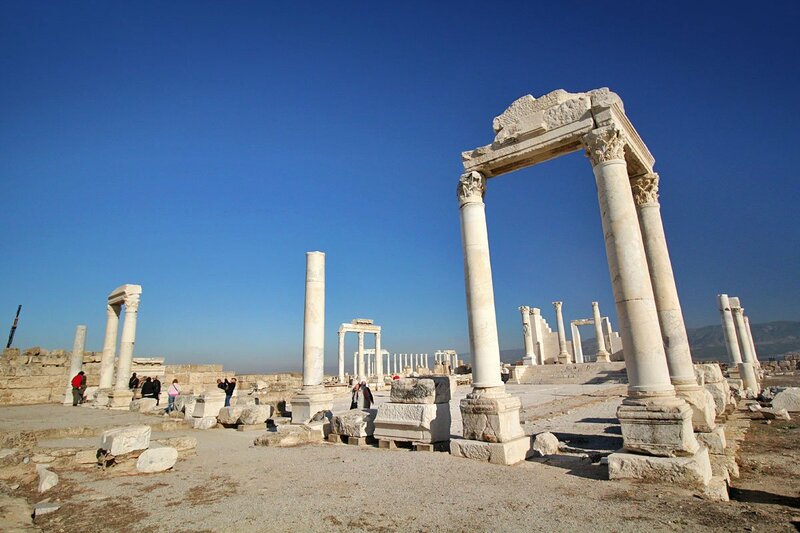 Laodicea was built by King Antiochus II in honor of his wife Laodice around 260 BC, making it almost 2,300 years old. Entrance to the archaeological site is 10TL. 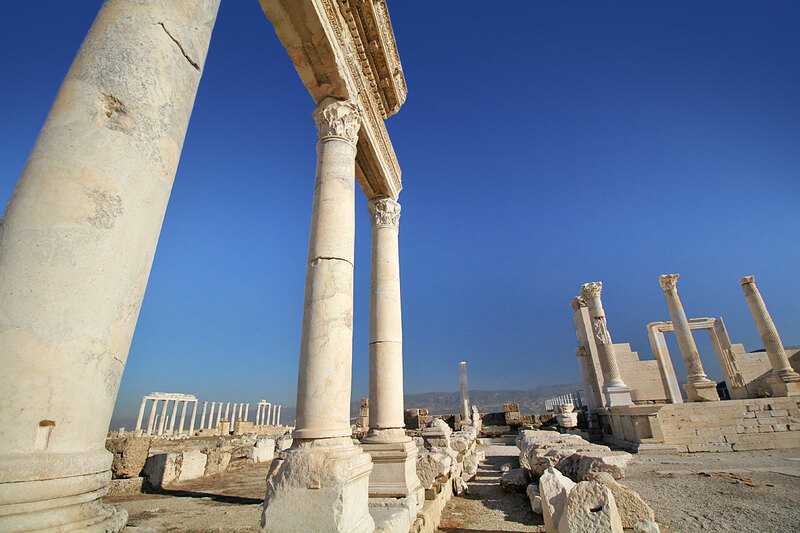 Laodicea has been destroyed and rebuilt several times through the centuries, most significantly during the great earthquake in 60 AD. By the early 1200s, it had been reduced to rubble. Most of it still lies in ruin today though restoration has been underway since the early 2000s. You’ll find evidence of this throughout the site. Colonnaded street. 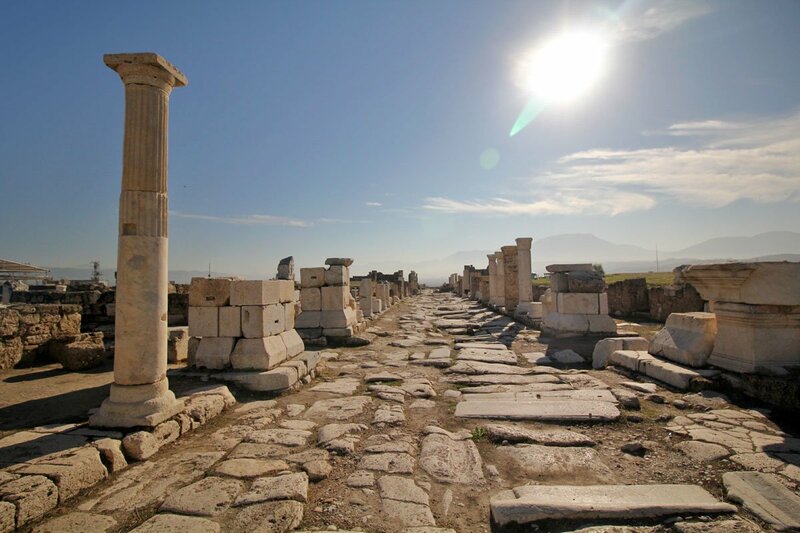 Though Laodicea wasn’t a place of much significance at first, it prospered under Roman rule and became one of the most important commercial cities in Asia Minor. Large financial transactions and an extensive trade in black wool was conducted there thanks to its strategic position along a popular trade route. 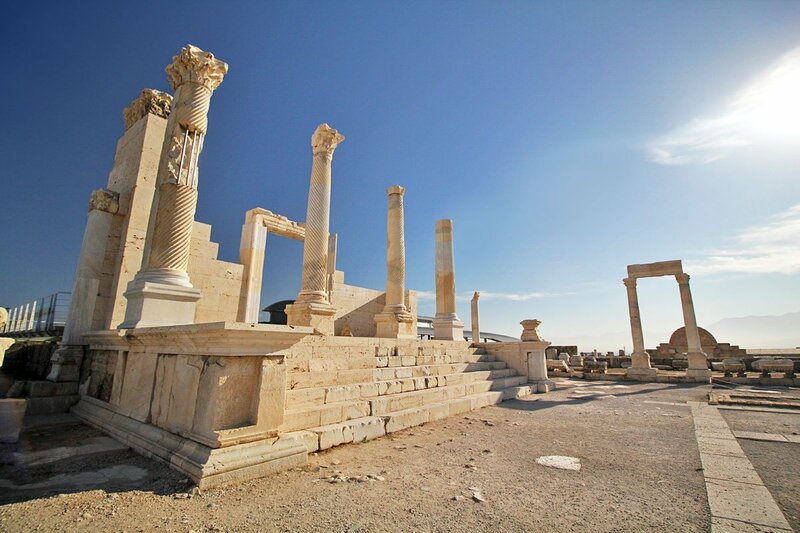 Laodicea was also home to one of the Seven Churches of Revelation. Also known as the “Seven Churches of the Apocalypse” or the “Seven Churches of Asia”, these were the seven major churches of early Christianity as described in the Book of Revelation. 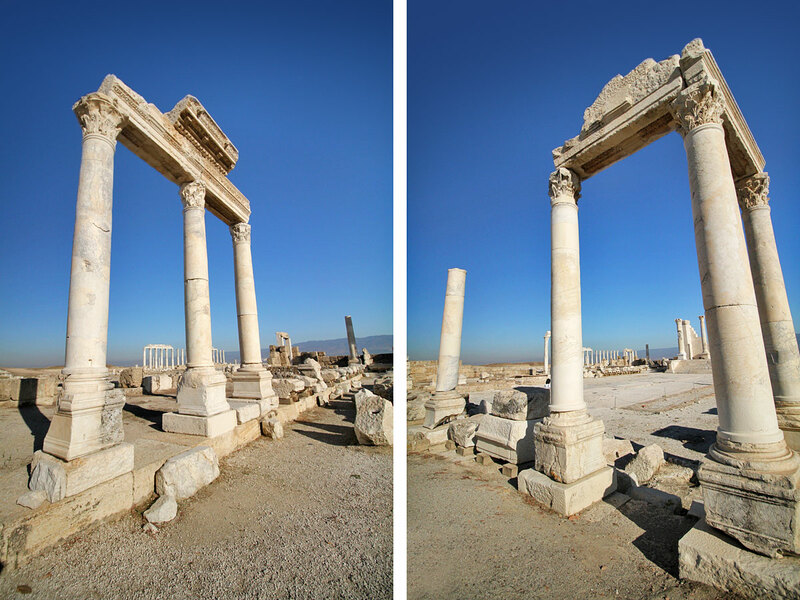 The remains of Temple “A”, which is at present one of the better preserved structures at Laodicea. Established in the 1st century AD, Temple A was originally built in dedication to Apollo, though his sister Artemis was soon worshiped here as was the Imperial Cult. 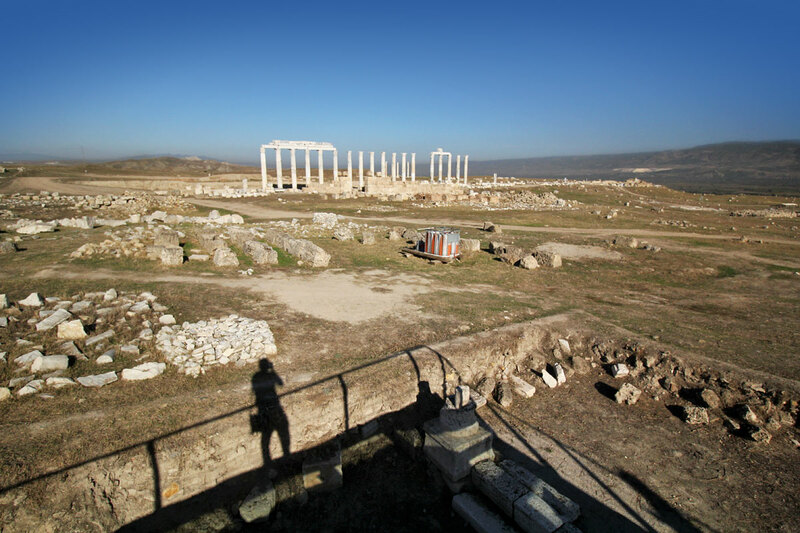 Within a few years, the excavation and restoration team hopes to make Laodicea another Ephesus. Apart from these columns, excavation in the past decade has turned up thousands of ancient artifacts, including the heads of Augustus, Dionysus, and Aphrodite sculptures. Sculptures of Zeus and Hera have also been discovered. Piece by piece, Laodicea rises from the dead. With Denizli being a centuries-old center for textiles, one of the excavation team’s top priorities is to discover signs of textile and dye workshops. 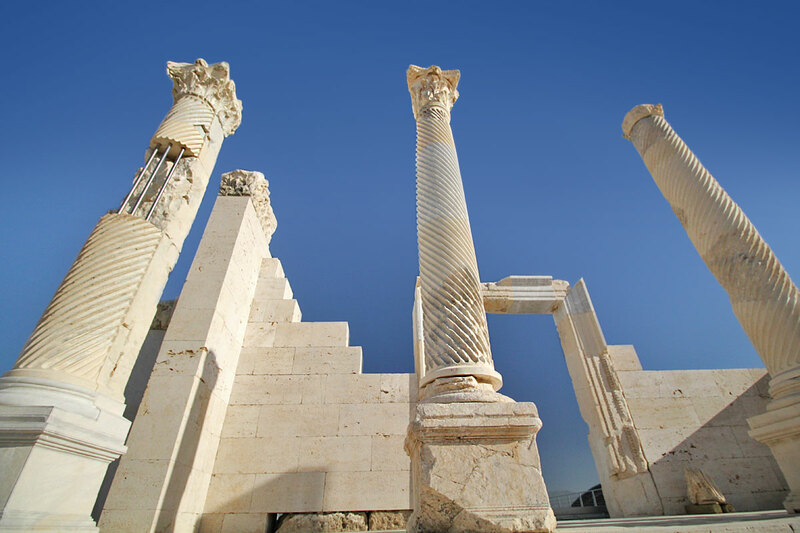 The columns at Laodicea are remarkably well preserved. Excavations have revealed temples, a Greek Agora, a stadium, baths, a gymnasium, theatres, and a bouleuterion (Senate House). 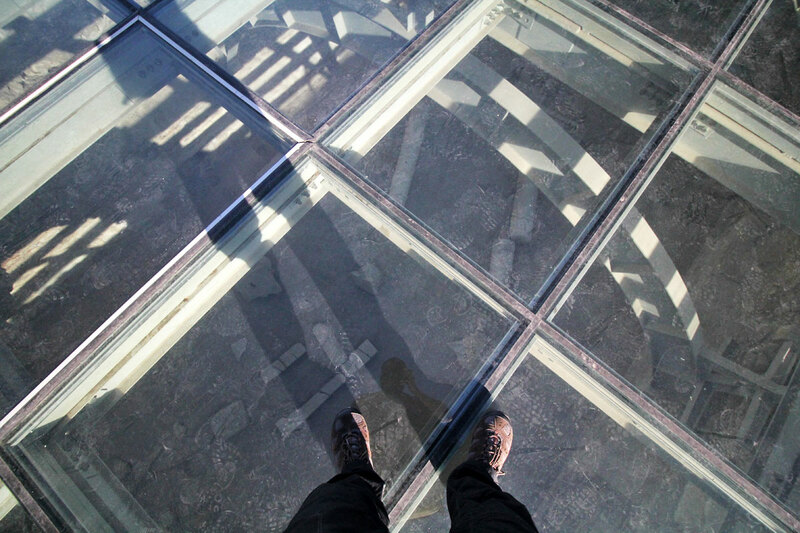 This glass platform was fun. It allows you to see ongoing excavation work as it happens right under your feet. 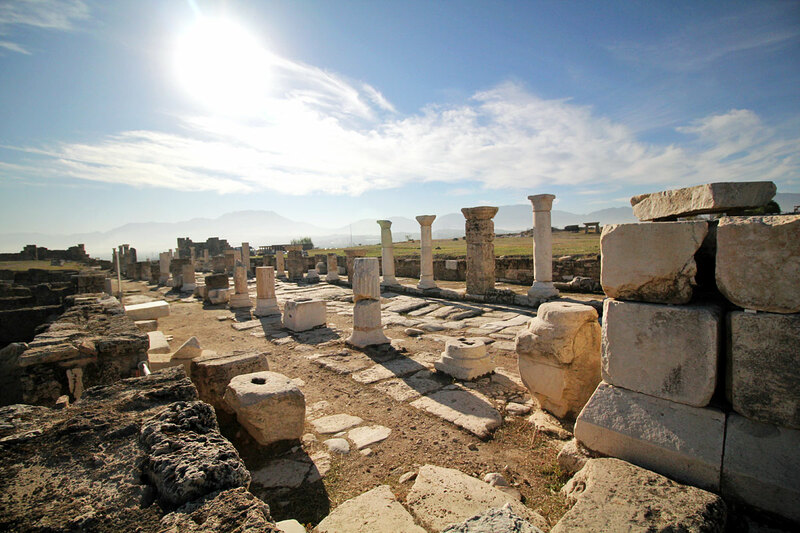 Laodicea is spread over 5 sq km — most of which is still unexcavated and unrestored — though you can visit the restored sections in as little as 30 minutes. Not sure what it is, but this building was undergoing restoration at the time and closed off to the public. 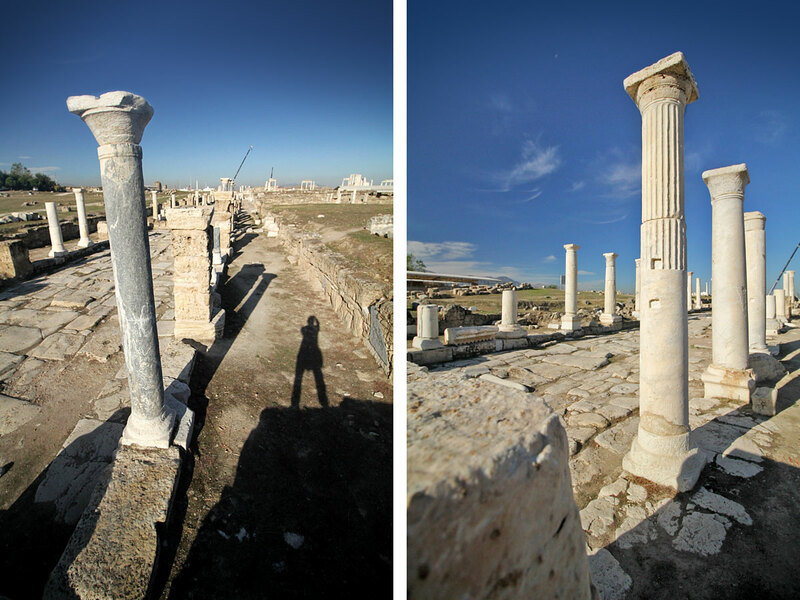 As you can see from these pictures, archeological and restoration work is still very much under way at Laodicea. 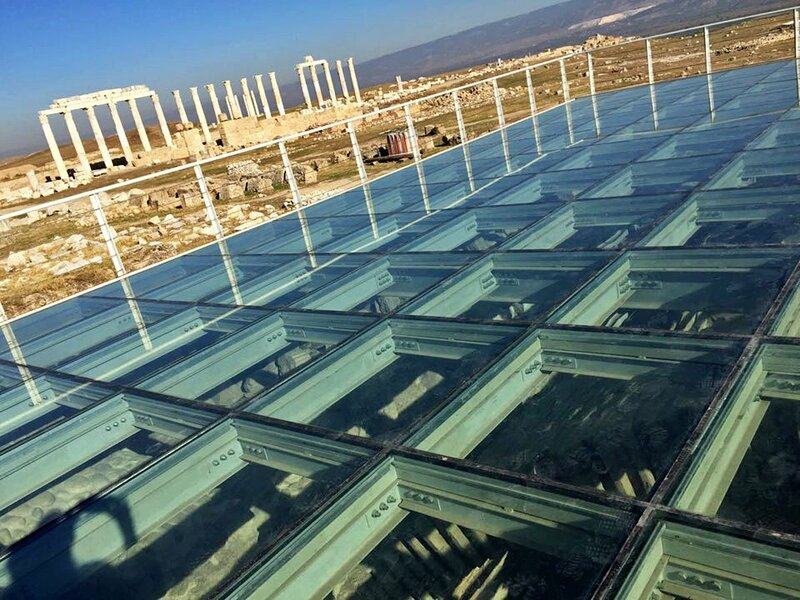 It may take years, perhaps even decades to complete, but there’s enough to see here now to merit a visit if you’re already in Pamukkale. 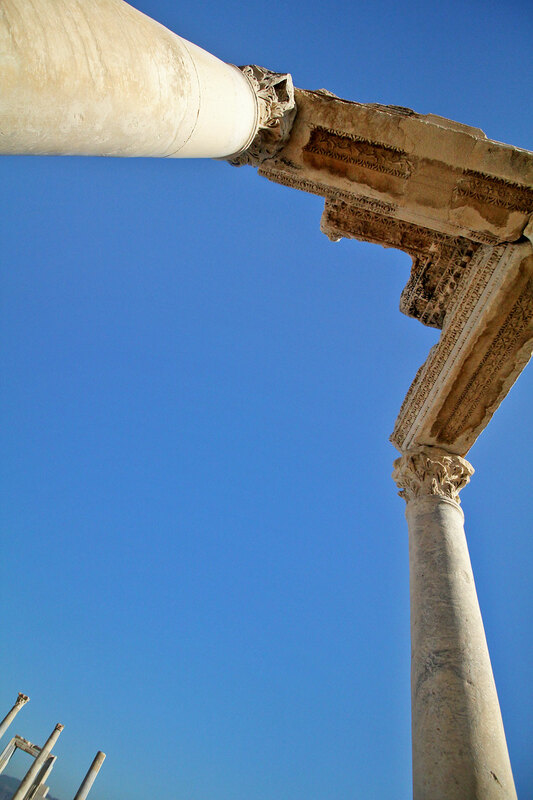 Around 5 km south of Pamukkale and 6 km north of Denizli, we visited Laodicea en route to Aphrodisias. We paid 215TL each (entrance fees included) for round trip private transportation to Aphrodisias, Laodicea, and Kaklik Cave which we arranged with our hotel — Bellamaritimo. 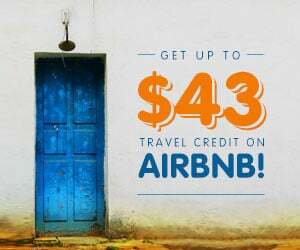 If you’ll be visiting Aphrodisias, then this may be the most convenient option. 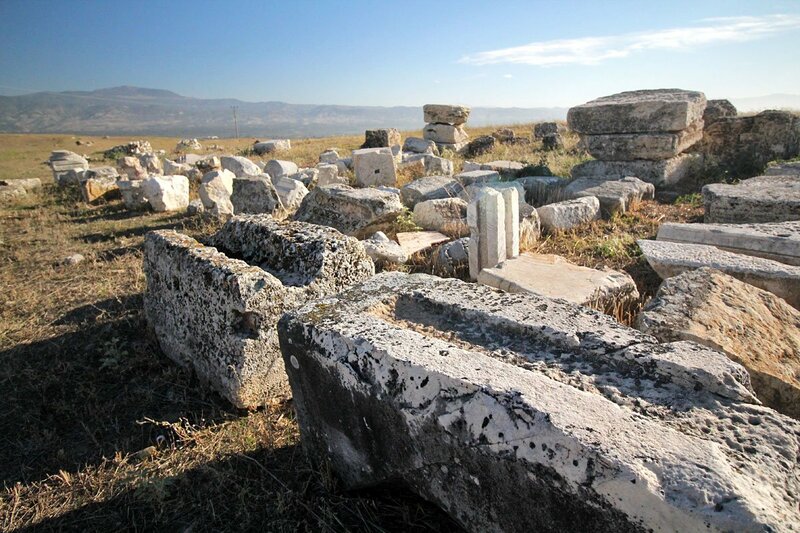 Otherwise, Laodicea is easy enough to visit on your own from Denizli or Pamukkale. Directions below. 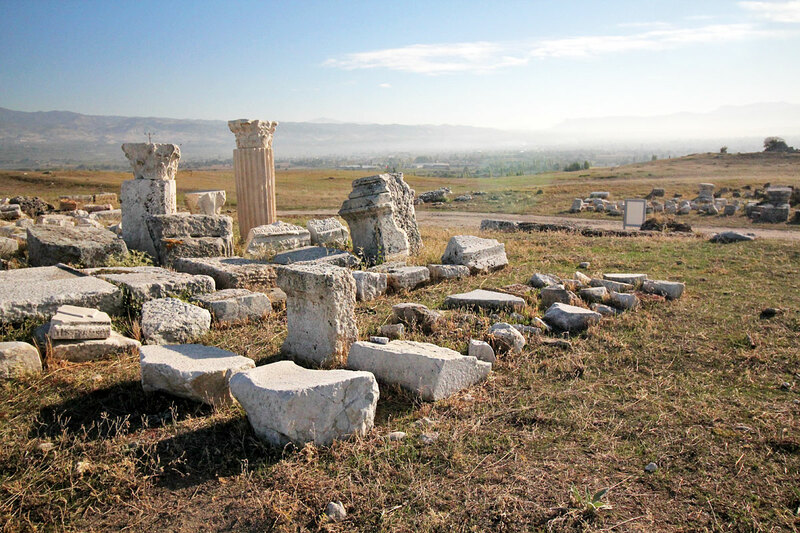 6 km north of Denizli and 1 km west off the road to Pamukkale, Laodicea is accessible via the Denizli-Pamukkale minibus. The minibus to Pamukkale departs every 20 minutes or so from peron (gate) 76 on the lower level of Denizli’s otogar (bus station). Tell the driver you’d like to go to “Laodikya” so he’ll know to drop you off at Ören Caddesi (street). Turn left into this road and walk for around 1 km until you reach the entrance to the archaeological site. (If you’re coming from Pamukkale, then turn right.) Fare from either Denizli or Pamukkale to the corner of Ören Caddesi should be around 2TL.